We had a great visit from my Mom and Granny last week for Rowen's birthday. Rowen loved having all of their attention, eating all of their yummy cooking, and running them ragged every day! 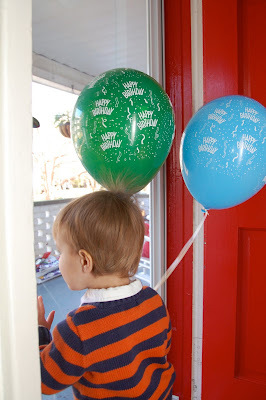 Rowen walked around all weekend saying "TOOO-WA" for his new big boy age and asking for cake and b-b-boons (balloons). 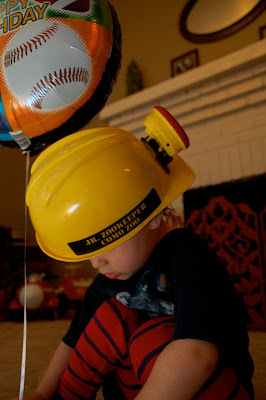 Grandpa Snow (who Rowen has been calling Pa lately) and Grandma Cindi sent this awesome Como Zoo hard hat with a head light and Rowen can't get enough of it! Here's Rowen and Gmama with his birthday cake! Funny story...over Christmas, we were out running errands and Rowen was growing weary. I promised him chicken nuggets if he would just hang on with me and with the most pitiful voice he could muster, he said, "Chiiiicken, bok, bok..." Ok, so maybe you had to be there, but it really was pretty hilarious. Stay tuned for pics of Rob Coming Home and The Snow and The Birthday Party! happpppy 2nd birthday!!! what a cute boy. and do i see his hair is a shade of strawberry?!?? when did that happen!? he's a doll. i hope he had a fabulous day!